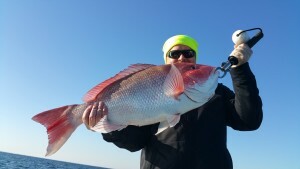 This week Guy from Illinois got a taste of what this year’s Red Snapper will look like. With a proposal waiting to be approved, Snapper season most likely will open early in May. This would be the earliest the season has opened and the longest season that we have seen in years. The calendar is filling up fast as the news travels so give us a call to book your family a trip full of memory’s! !